There were a few things that I was not sure of when I started working with my sourdough and one of them was whether or not I could make bread using my bread maker. 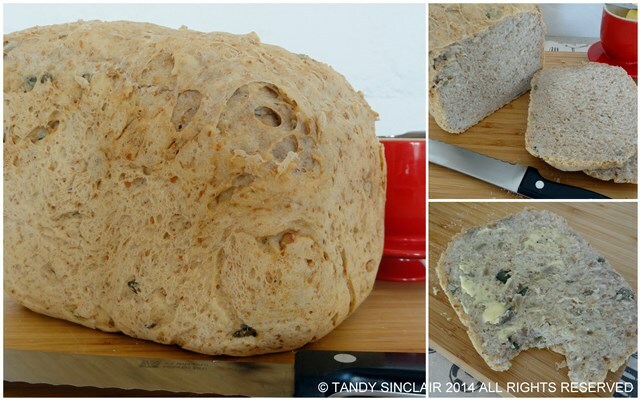 This proved to be a great success and I often make the dough for my rolls in the bread maker as well. Another thing I was not sure of was whether or not I could freeze my starter, Last October when we went overseas I placed Cordelia (my sourdough starter) into a honey jar and put her into the freezer. I left her there until December and I was most surprised at how well she survived the cold. I had kept some dried sourdough aside for ‘in case’, and just added a pinch of the flakes to her when I woke her up. This was such a relief as when we travel there is no one to feed my starter. Another issue was whether or not I could get a whole wheat recipe to work for the bread maker. After a lot of loaves, where I slowly increased the whole wheat flour ratio to the white flour ratio, I can happily say that this recipe is perfect. I might try add more whole wheat in future, but I know that this works and so for now, this is what I have been making each weekend. Do you use a bread maker? Hi there Tandy, sorry for my delay life has been a whirlwind and so glad I stopped off to get a slice of your delicious bread. I have not made my own starter or nor do I own a bread maker but I would love to do more baking. I am glad you put forth the test on your starter dough in the freezer, it sounds like the starter just kind of went into hibernation in the freezer, right? Love sourdough. Thanks for sharing the recipe! Hi Tandy, so cute you named your starter Cordelia. Pinned. Tandy, I love that your starter has a name. I have a bread machine and love using it when I am busy. It’s so easy to just pour everything in and get great bread. I’ve never made wheat bread with a sourdough starter. It looks delicious! I love sourdough and this loaf looks absolutely fab. That looks really good, Tandy. Me too, I always wonder if I could put more whole grain in breads and things. No bread looks and tastes better than home-made ones. Just like this! Looks good, tastes good, smells good! Scrumptious loaf of bread. I do use a bread maker from time to time. There’s nothing more warm and inviting than returning to a house smelling of fresh of bread baking when you return from out of the house to run an errand. And nothing beats that smell! yum. I don’t have a bread machine…it must be a great addition to your kitchen. I’m sure your bread is really good with the seeds added in. Great loaf – I have a breadmaker in Spain but never thought to use it with my sourdough starer so when I get back I’ll give it a go! Looks like a lovely loaf Tandy. Thank you Mandy, and you too!